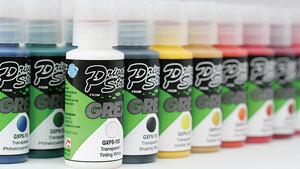 Grex Private Stock Airbrush Color Special FX Bases add versatility to the already versatile Private Stock Color System. These products can be mixed directly with Private Stock transparent colors or sprayed over transparent or opaque base colors to obtain dazzling effects. Note — These bases are not recommended for use with very fine nozzle airbrushes.